A Green Frog sits on a rock in front of my home's small pond. The most common pond frog in our region is the Green Frog (Lithobates clamitans melanota, formerly classified as Rana clamitans melanota). Although it is the typical and most widespread of our frogs, despite its name, it is not always green. They can vary in skin color, though usually they're green to brown and often have blotches. These mid-sized amphibians have white bellies and are are best told apart from the the very similar looking Bull Frogs by the fold of skin that forms a ridge along their sides. This dorsolateral fold curves around the ear drum in Bull Frogs. Males have an ear drum (tympanum) that is larger than the eye, while female tympanums are about the same size or slightly smaller than their eyes. This by the way is true in Bull Frogs as well. Males also tend to have bright yellow throats when in breeding condition. Even if you don't see them though, you can often tell that Green frogs are about because they commonly give a high pitched "squeenk" call when they are startled and jump into the water. A male Green Frog showing the large tympanum (ear drum) and bright colored throat, as well as the dorsolateral skin fold typical of all Green Frogs. Otherwise, males also can be identified by the rubber-band like twang call they give when trying to attract mates and establish territories. Females lay a raft-like mass of about 1,000-7,000 black-and-white eggs that hatch about a week after being laid. The tadpoles are plump with pointy tails, often taking about 90 days to metamorphose into froglets by the Fall. Sometimes however, a few tadpoles overwinter as tadpoles, the only local frogs to do so other than Bull Frogs. Adult Green Frogs overwinter on the bottom of ponds or slow steams, under the leaves and mud. A Green Frog Tadpole feeding on algae at the bottom of a pond. These frogs are one of the first to colonize new water systems. They have been known to disperse up to 3 miles from their natal pools, often following streams or travelling over land during wet weather. Many things eat Green Frogs, from dragonflies while they are tadpoles, to herons, egrets, larger bull frogs, raccoons, and so many other predators. Even humans eat their frog legs. If they survive all these dangers, they can live for 5 or so years. These frogs often struggle vigorously when captured, unlike so many other frogs that just seem to give up once caught. Some studies have demonstrated that aquatic invasive alien Japanese Knotweed plants reduce foraging success in these animals (since less things eat the exotic plant to begin with). Otherwise, they can survive in even small, clean bodies of water. I have 3 that live in my tiny 100 gallon home pond. I love the way they jump when I get nearby (though at times I can get right next to them without their moving), usually accompanied with a "squeenk" and "kerplunk." I also enjoy the one male that calls every summer and when they stake out my porch lights during wet weather for fallen bugs. They may be common, but I find Green frogs quite interesting, like I find most "wildlife" that lives in my backyard. So next time you go by a pond, listen for their telltale calls and see if you can get close enough to really observe them. There are a couple of legends having to do with the naming of the Passionflower which I posted about just recently. My favorite (myself being of Peruvian descent) goes back to 1620 when a Jesuit priest came across a beautiful plant in Peru. That night, he said he experienced a vision in his sleep that revealed the symbolism of this beautiful plant representing the suffering of Jesus Christ during his crucifixion, what is referred to as the "Passion of Christ." The plant he believed was revealed to him so it could be used to help explain the crucifixion and suffering (passion) of Christ to others. He thought it would be useful to help in the conversion of the native Inca people to Christianity (something already being done by the sword and by the cross). 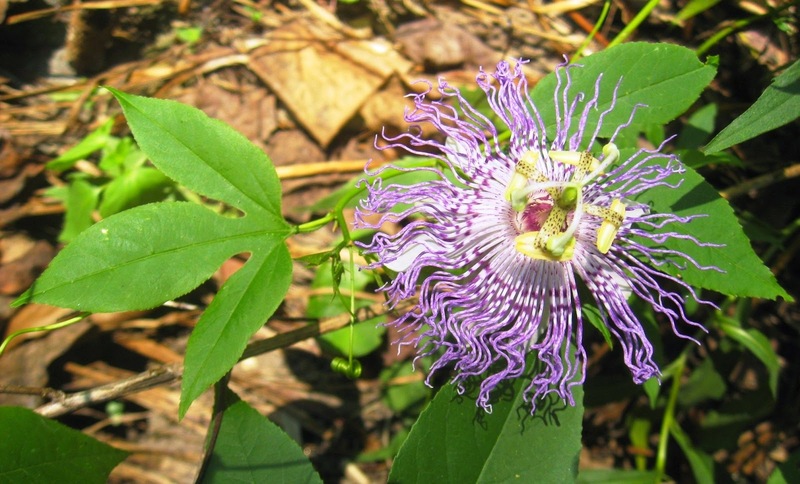 In his vision, the various parts of the plant could be used to help teach about the "Passion of Christ" and so all members of this plant family came to be referred to as "passionflowers." The leaves represented the head of the Centurion's spear that was used against Jesus. The spiraling tendrils the vine uses to climb represented the whips used to scourge and lash him. The central flower column was seen as the pillar Jesus was strapped to while he was whipped. The five petals and five sepals represented the 10 faithful apostles (omitting Judas Iscariot who betrayed Jesus and Peter who denied him when he was arrested). The three pistils became the nails used to secure him to the cross. The lowers five anthers represented the five wounds delivered to Jesus. The purple filaments or corona symbolized the crown of thorns placed on his head. The reddish spots present on some species could appear to be the blood that was spilled. And finally, the round fruit represented the world that Christ was said to have died to save. So that is the legend that supposedly led to the naming of this beautiful plant. In fairness, the other version has the same elements but supposedly originates with an Augustine friar from Mexico. Regardless of what it was said to symbolize or not, the name stuck in various fashions throughout the world. There are hundreds of species, but we only have two passionflowers locally, with the Purple Passionflower (Passiflora incarnata) being shown above. The much smaller and less showy Yellow Passionflower (Passiflora lutea) is shown below. It's small fruit (berry) is not very edible. The Yellow Passionflower is a much smaller vine, with a less showy flower and inedible fruit that turn purple when ripe. A Passion or Apricot Vine with a flower and green fruit. 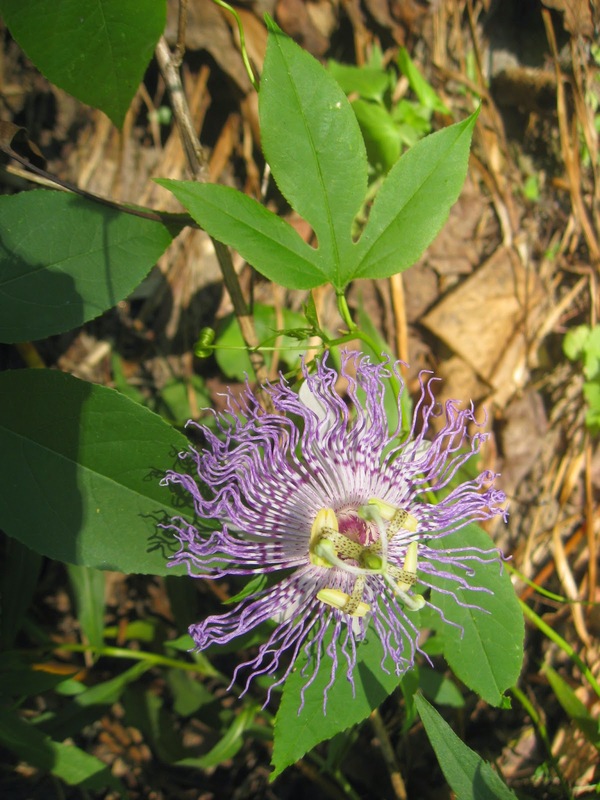 One of my favorite vines and prettiest of wildflowers is the Purple Passionflower (Passiflora incarnata). It goes by quite a few common names: Maypop (because of the popping sound the fruits make when stepped on), Mollypop, Pop-apple, Apricot Vine (due to the tasty fruits), Granadilla ( in Spanish), Maracuya (in Spanish), Maycock, Wild Apricot, Ocoee (a Cherokee name, also applied to a river, because of the fruit), Holy-trinity Flower, and Passion Vine (more on the use of the word "passion" in a follow-up blog). The tropical looking plant with 3 inch lavender blooms (which occasionally are white) is the state wildflower of Tennessee. This is one of the two northernmost perennial native passion vines (the other is the smaller and less showy Yellow Passionfower, Passiflora lutea), but is nearing the edge of its range in our region. It can grow 25' in one season, but is usually half that size, either sprawling on the ground or climbing using its tendrils. In our area it dies back to the ground each season and is a late starter, but grows quite rapidly once it gets going. Purple Passionflower prefers sunny locations, but can stand a bit of shade as well. This affects how many flowers it makes and how late it blooms however. It may not fruit reliably every year, but spreads quite readily by producing suckers up to 10' away from the previous year's plants. Although a beautiful, tropical looking flower, this needs to be kept in mind by those wishing to include it in their gardens. A ripe Maypop, note the dark seeds once the pulp is removed. Some people may be familiar with the tropical passion fruits which are often used in breakfast drinks. The fruits (berries in botanical terms actually) themselves are quite tasty, and our native Purple Passionflower fruit has a very similar taste. Indeed, its edibility led to its name of Apricot Vine. The superb taste even led naturalist John Muir to declare it "the most delicious fruit I have ever eaten." The fruits are edible once they start turning yellowish, fall off the vine easily, have a rich aroma, and are about the size of chicken eggs. They may be a bit wrinkled at this time. The sure test is to split one open, look for dark seeds buried in aromatic, juicy pulp, and of course taste it! A few Maypops I collected. The fruits can also be made into juice, wine, pies, jam, even smoothies by enterprising souls. Both the pulp and seeds can be consumed. My wife makes some great, refreshing juice from them, much like she did in her home country of El Salvador with their native species.The leaves have been used as teas (as their tropical relatives still are) and are said to have quite a sedative effect, being used to treat nerves, insomnia, and stress to this day. Parts were even used as an aphrodisiac. In Bermuda, some used it as a perfume base. The Cherokee used an infusion of the crushed roots to treat boils, thorns/spines, and even poured it into ears for aches. A batch of Passion juice my wife has prepared, ready for the pouring. The flowers truly standout, not just to us, but to wildlife. They are usually covered in bees, especially bumblebees and carpenter bees. The plant itself serves as a host plant (caterpillar food) for a variety of butterflies such as Gulf Fritillaries, and the various Longwing butterflies (Zebras, Julias, etc.) which rarely get to our region. Locally, the Variegated Fritillary uses it as an alternate host. Five species in total have been recorded in North America. Of course, all sorts of critters eat the fruit as well. Bumblebees and Carpenter Bees tend to be the main pollinators in our region. This truly is one of my favorite all around plants: beautiful, tasty, and important for wildlife. What more can you ask for? Large Milkweed Bug (Oncopeltus fasciatus) on a milkweed seed pod. I have always been fascinated by milkweed communities and all the adaptations that allow their inhabitants to survive there. Planting milkweeds for monarchs is getting more popular today, but many other creatures also benefit from milkweed (and many other plants can also be as good or better at providing backyard habitat as milkweeds). I am fairly familiar with these food webs, including the interesting bugs that inhabit them. But one of the things I love about my being a naturalist is that you learn new things just about every day. That was the case with these fairly well-studied insects which I will describe to you. First of all, milkweed bugs are brightly colored insects with sucking mouth parts that have evolved to (mostly) live on milkweeds. The toxins that normally protect the milkweeds (cardiac glycosides) are absorbed and used to then protect the milkweed bugs that feed on them. They advertise their toxicity with bright colors, like many milkweed feeding specialists do. Large Milkweed Bugs (Oncopeltus fasciatus) are one of the most studied insects in science. They prefer to feed on milkweed seeds, but can be reared on other types of seeds. They are thus easy to keep and are used in many science experiments. Those that do not feed on milkweed retain the warning coloration, but are not toxic. Adults are one of the few migratory insects we have, normally heading South during the Fall. They are distinguished from the other milkweed bugs by their larger size and the dark band across their backs. Small Milkweed Bugs (Lygaeus kalmii) have a similar life cycle, but are more apt to feed on things other than milkweeds and do not migrate. They also will nectar on flowers, as you can see by the one in the picture feeding on Queen Anne's Lace. They are distinguished from other milkweed bugs, as most identification books tell you, by the "X" across there backs. However, it is also, I now know, good to look for the heart-shaped mark above the "X." What most books do not tell you is that there are other species of milkweed bugs and that even many experts sometimes misidentify another milkweed bug for the Small Milkweed Bug. I discovered this for myself not too long ago when I spotted some milkweed bugs, but noticed that something wasn't quite right. First of all, most were not on milkweeds. That in and by itself is not as big a deal since milkweed bugs sometimes feed on other plants, as I have mentioned. But they also didn't look quite right and were also concentrated on False Sunflowers rather than the milkweeds that were right next to them. I snapped a couple of photos and that was that. However when I looked at my photos again, I realized that none of them were on milkweed and that they were mating, but not interested in the milkweeds. I then also saw that though I had Large Milkweed Bugs, that I appeared to have two other milkweed bugs that had slightly different patterns on their backs, including many that did not have the heart-shaped mark above the "X" that should have been there. A bit of research later, plus sending my photos to the experts at Bug Guide for confirmation, had me finding out that there was indeed another local milkweed bug that I had never heard about until I looked for it. I had now learned about False Milkweed Bugs, a species that is mistaken for Small Milkweed Bugs sometimes even by experts and in books/online photos. Although they can feed on milkweeds, they also feed on a variety of other plants as well. The mark they have above the "X" is slightly different from the heart-shaped one in the actual Small Milkweed Bug. Most of my professional life I had been looking at not two, but three different species with somewhat different life cycles and niches in the natural world, despite my thinking I was fairly well versed in milkweed communities, or at least these fairly well-known creatures. That again is one of the things I love about my profession, the new discoveries, especially when they are triggered by my curiosity or when I notice something different. I love these little mysteries and when I learn something new, as I try to sort out what I consider to be nature's interconnected and fascinating puzzle. I have been asked many times by people about the black squirrels we have in the DC area. Though they are actually just melanistic versions and the same species (Scirius carolinensis) as the regular Northern Gray Squirrels, they actually have an interesting history behind them. I thought a little bit of natural history history might interest folks. As I stated before, the black squirrels are actually the same species as the normal backyard squirrels we have all around and can freely interbreed with them. They were purposely reintroduced, along with the "normal" gray squirrels, back into the DC area in the early 1900's after there was concern that there wouldn't be any squirrels of any type around any more locally, that they had been close to being extirpated. Gray squirrels were indeed very rare, having been mostly hunted out long before. By 1906, hunting was prohibited within the city and people wanted to bring them back, believing they would be great additions to parks. So gray squirrels were released at several DC parks such as Lafayette Park. They were fed by people and even by Park Police. Teddy Roosevelt, who had quite a menagerie of pets anyways and loved squirrels in general (he had flying squirrels at his cabin for instance), had them released at the White House in 1907 as well. A great movement to reintroduce them was succeeding. Both a normal gray and black gray squirrel share a tree in Arlington, Virginia. But what about the black squirrels? These may also be a result of Teddy Roosevelt. It seems that in both 1902 and 1906, 18 black squirrels were brought to the National Zoo from Ontario, Canada. Black squirrels are much more common there, likely because the dark color gives them a heat advantage that offsets any disadvantage from their not being able to hide as well. These 18 dark squirrels were released from the zoo sometime after 1906. By 1917, the first road kill of a black squirrel was recorded. So the National Zoo became ground zero for these darker squirrels. Since there were not as many "regular" gray colored squirrels and the black ones may have had a heating advantage (and no predators were around to hunt them), the recessive dark genes were allowed to establish themselves in the population. Now almost half the squirrels around the zoo are black or darker in coloration. Being protected and well fed, squirrel populations exploded. In fact, a 1980's study resulted in the claim that no where else on earth were there squirrels more densely populated than Lafayette Park. The black squirrels also continued to spread, by the 1980's being found in some numbers in Arlington, Virginia and parts of Maryland. Now up to a fourth of the squirrels in these locations are dark. Squirrels are of course rodents, and breed as fast as many rodents do. They have spread and their numbers now can be quite abundant. "Tree rats" in fact have been declared one of the top 100 world's worst invasive alien species by the World Conservation Union, causing issues in places such as Great Britain and other parts of Europe where they do not belong. Time Magazine listed them as one of the top 10 most invasive animals in 2010. Yet while some bird feeders and gardeners in the USA also wage their wars on squirrels, many other people thoroughly enjoy them. They have become regular features of our neighborhoods despite their rarity a century ago. This black gray squirrel appears to be lactating and so appears to be raising more squirrels. Each litter may contain both black and normal colored gray squirrels. Broad-leaved Arrowhead (Sagittaria latifolia) is currently in bloom in our wetlands and goes by a variety of names: Duck Potato, Wapato, and Indian Potato for instance. It is also called Katniss, a name now made more famous for its use for the main character in the Hunger Games, Katniss Everdeen. She was indeed named for this once very important food plant. Broad-leaved Sagittaria in bloom in Tuckahoe Park, Arlington, VA with its 3 white petals in whorls of 3. In fact most of it's names allude to its edible properties, including the tribal terms Wapato and Katniss. The underground tuberous roots are the most prominent food source and were very valuable to Native American Indian people, whether eaten raw or cooked. There are written accounts of indigenous women going into frigid waters in the middle of winter to try and obtain them. The tubers sometimes floated to the surface, but more often had to be worked free with much effort. The arrowhead-shaped (sagittate) leaves that give it its common (Arrowhead) and scientific (Sagittaria) names can also serve as cooked greens, as can the flower stalks prior to blooming. The Genus Sagittaria is named after Sagittarius the Archer which also gave the astrological symbol. It ranges from Canada into South America, and has also naturalized in such places as Hawaii, Australia, and many parts of Europe. Other tribes used it medicinally: the Cherokee used the leaves as an infusion to treat fevers, the Chippewa for indigestion, the Iroquois for treating boils, rheumatism, and as a laxative, and the Potawatomi for wounds and sores. Civil War doctor Francis Porcher's so-called "Confederate Ethnobotany" also mentions edible and medicinal uses to consider during war time. Arrowhead is also the host plant (food) for 5 different caterpillar species. The name name Duck Potato refers to its favored status in attracting ducks, something the Potawatomi tribe reported as part of their hunting tradition (though they prefer the seeds over the tuberous roots in most cases). With the popularity of the books and movies, I thought people might want to know a bit more about why the main character, a forager and hunter living a life of subsistence in a poor community, would be named for this once very valuable plant. Arrowhead in bloom. The male flowers have yellow stamens while the female have bulbous green centers. Silver-spotted Skipper Butterfly sharing a meal with a European Honeybee on Hoary Mountain Mint. I'm now back from my vacation and am ready to continue the Blog. Since there has been conversation among the environmental community regarding how few butterflies there are this year, I thought I would talk about one kind that is having a very good year. Silver-spotted Skipper butterflies (Epargyreus clarus) are very common this year and most others because they can use a variety of both nectar and host plant (caterpillar food) resources. The caterpillars can feed on most kinds of legumes, though Black Locust trees are among their most favored, perhaps because they are so large and common in our area. Male skippers will often stake out a territory around a patch of host plants and fly out to investigate any thing that ventures in. If it's another male they will chase it out; if it's a female, then they will pursue her. Occasionally they challenge a bird or dragonfly and pay the price for it. They often return to the same perch to watch over their chosen territories. A Silver-spotted Skipper oviposits an egg under the shelter of a Black Locust tree. The photo above shows a female that is ovipositing (laying) her eggs on protected areas of Black Locust. She will land and "drum" the leaf surface with her feet, "tasting" it to make sure she has some form of leguminous plant before depositing them. She generally spreads her eggs out and does not lay more than one egg per leaf. The folded leaf shelter of a Silver-spotted Skipper caterpillar on its host plant. The caterpillars make shelters to hide in by folding a leaf over themselves and holding it together with silk. As they get bigger they make bigger shelters or may even pull several leaves together to conceal themselves. Their leaf hide-aways are very clean and made fresh regularly. They actually fling their frass (droppings) away from their shelters, helping prevent any predators from detecting and finding the larvae. They can sometimes project their frass up to 5 feet away, remarkable when you realize how small the caterpillars themselves are. 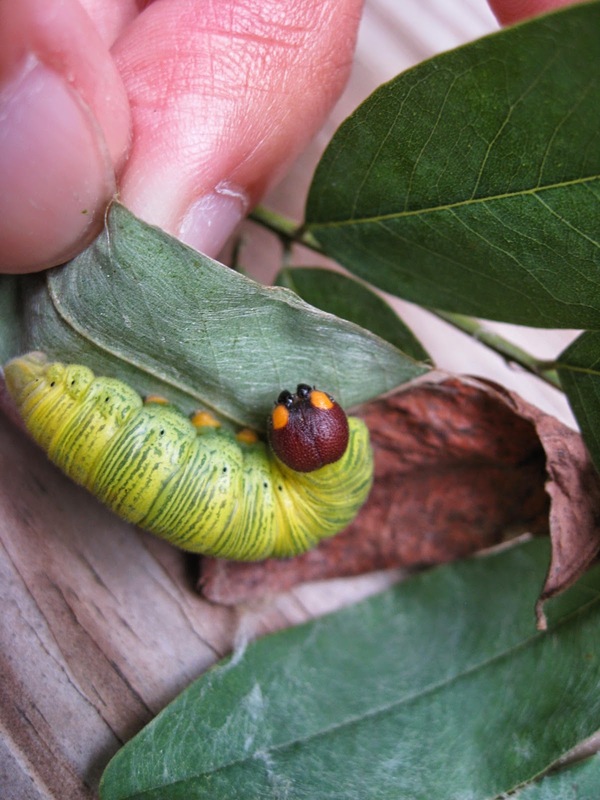 The fake eyes of a Silver-spotted Skipper caterpillar threaten you once you open its shelter. If you open up their shelter, you may be surprised by what they look like. Like most skipper butterfly caterpillars, they have a constricted "neck" that gives them a fat-headed appearance. But it's their fake eyes that may startle any potential predator. They will sometimes wiggle around and even open and close their mandibles in a threatening manner in the hopes they can frighten the intruder away. They are of course completely harmless, but it is always neat when I lead a walk and reveal what's hiding sometimes in the bushes or patrolling the air.